Someone please tell me what this thing is? 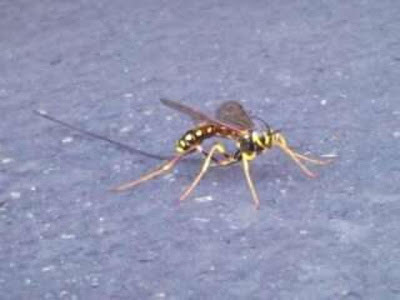 Sorry about the picture quality I had to zoom in on my camera phone to get a decent picture, but the thing was about 3 inches long with its tail (or stinger?!) and yellow and black like a wasp. Its wings had a slight purple tint to them. Very pretty bug.